This post provided me with much mirth and merriment. Tracy hosted yellow week this week and I did a little post just letting you all know it was yellow week with a picture of a token yellow flower. So, my 'serious' posts are typically done just before the weekend and I was wracking my brain on what I was going to do. I wanted to continue my theme of collages around my colorful, recently knitted socks and stay true to yellow week - I was a bit stumped creatively. 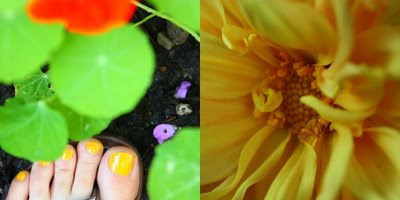 I went out to the garden to water my flowers and to think and as I was pondering my lack of ideas I looked down and saw my toes peeking out from under a leaf...they were yellow - OPI yellow - kind of a curry color...I was so excited, ran inside, grabbed my camera...and my theme was born. I thought the Babe would split a gut as he was watching me bending over taking pictures of my toes, socks, flowers....I comprehend that it probably looked ridiculous...but, I am a blogger and I will go to extreme lengths to create my post! Ahem. I think pretty soon I will need therapy. The yarn from the socks above were purchased from Jessi at Alabama Fiber Dreams. Check out her Etsy store here. I must say, this yarn is the softest I have knit with and the socks are so comfy.